This fun play panel attaches to 2 vertical posts (included). Kids can turn any cog and see the others move in all directions! 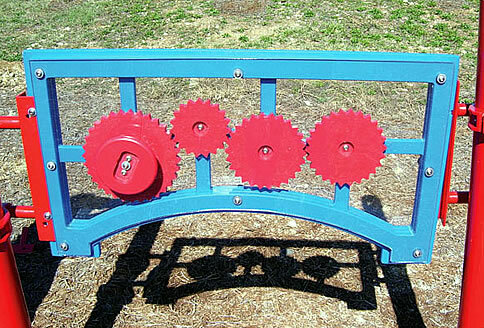 This fun ADA gears play panel structure gives your ADA-needs kids 4 gears to mesh and turn. There’s plenty of room below the panel to fit a wheelchair, and the heights of the 4 post-clamps are adjustable (with a hex key wrench). The outside posts are made from galvanized steel, and they measure 3.5″ outside diameter. They are secured in the ground with concrete. Unit comes with panel, 2 vertical posts, and all the hardware needed to connect them. Price: Please phone for more information and shipping.